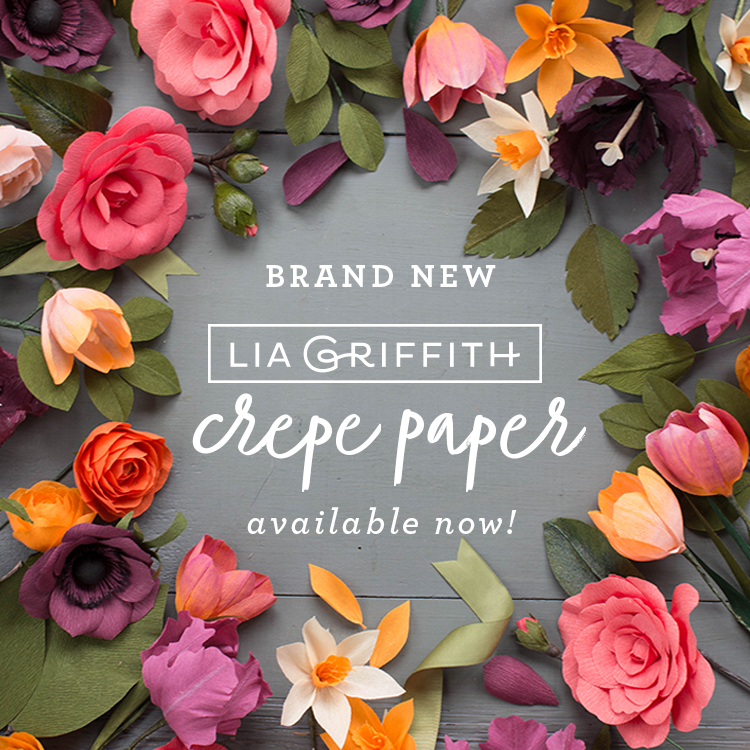 New Crepe Paper Available Now! Calling all crepe crafters… We have just introduced new colors to our crepe paper line! We’re rolling out new hues in both our heavy and lightweight crepe and they come in convenient 10 packs so you can craft till your heart’s content. All of our crepe is German-made and high quality. It’s free of machine lines meaning a consistent grain to produce remarkable results every time. Scroll down to learn more about our heavy and extra fine crepe paper below and a few more goodies that are new to our shop. To purchase our crepe paper or other crafting supplies, visit shop.liagriffith.com. Tropical Garden – Gold, Amber, Poppy, Tangerine, Mango, Cherry, Ruby, Merlot, Azalea, Fuchsia. Winter Garden – Pine, Spearmint, Pistachio, Gold Satin, Silver Bells, Snowflake, Egg Nog, Bordeaux, Holly Berry and Peppermint. Secret Garden – Colors include Lilac, Cypress, Fern, Camellia, Honeysuckle, Coral, Blush, Chiffon, Vanilla and Linen. On top of our new crepe paper, we’ve also added some new floral tape to our shop. You can now find new combos including fern & moss, bark & pine, and cream & gold in our shop. These colors are great for adding elegant and realistic finishing touches to your paper flowers. We have a few extra goodies coming soon to our shop as well. Keep your eyes peeled for new cloth covered floral wire and foam balls for forming the perfect paper flower center. I wish we had the right color for you! Have you tried using PanPastels to add color? Hi Tammy– the URLs are listed on page 12 of Cutting Machine Crafts, and page 31 of Crepe Paper Flowers. Pay close attention to the URLs and type them exactly as they appear in the book– they’re very specific and different than just liagriffith.com. Oh yay. I had actually given up ever seeing Lia Griffith paper over here in Australia. Just had a look at my local Craftonline shop and nearly fell off my chair !!!!!!!!!!!!! There were packets of Lia Griffith paper staring at me. Just did some online retail therapy. I am one happy little vegemite !!!!!!!!! Yay!! I’m so glad to hear it!! Love your products and feel they are so reasonably priced. I know you recently partnered with JoAnn’s Fabrics any chance you will start selling the Crepe Paper at the store? Hey Lia & Team – love all the new colours and your tools! Will it be long before they are available in the UK?